No company can perfectly predict how much revenue they will make in a given month, quarter or fiscal year just like no meteorologist can perfectly predict the weather. There are simply too many variables to consider. But perfection is not the goal. Forecasting is about getting close enough to make good decisions. So how do you start to forecast when there are so many moving parts? Neil Ryland, CRO at Peakon and previously at Huddle, found out the hard way when his team’s estimates were off by 40 percent. Ryland asked himself how the company could get its sales forecast so wrong and started to develop a new model. Here's how it evolved. Often sales forecasting can feel like a guessing game but the deal forecasting methodology is based on hard numbers. And it’s simple. Write down the deals you expect to close and tally up the sales revenue. That’s it — and at small organizations it works well. There’s very little admin overhead and it gets your sales team in the habit of clearly keeping track of future wins. The problem with this model is that you’ll quickly run into limitations if you want to forecast beyond your average sales cycle. For example, if your sales cycle is 30 days, it's impossible to forecast the following month as those respective opportunities wouldn't have been created. Seeing this first-hand, Ryland realized he needed a different model if he was going to forecast past 30 days. When you start looking for more advanced sales forecast methods, you’ll run into weighted forecasting (or Opportunity Stage Forecasting). This involves taking a deal, and based on its pipeline stage, assign it a probability to close. For example all deals in stage 4 in a 5-stage system may have a 75% chance to close. Ryland and his sales reps collaborated to build out a clear sales pipeline that included BANT and the typical steps to close a deal. Then, using historical sales data, he gave each stage a closed won probability. Huddle’s sales managers could weigh each deal according to the pipeline stage it was in and forecast from opportunities created. This model is perfect as you start scaling up and have reps juggling 8-12 deals a month. You’ll need to make sure reps are disciplined and educated in determining the stage of a deal. One of the problems with the weighted forecasting model is that it requires a decent amount of time and energy to be effective and doesn’t account for how a representative is feeling about a deal.  Combining this with the weighted data was a game-changer: it meant representatives needed to follow a sales process which forced a higher forecast accuracy and included data from the rep working the deal. Later, Ryland moved on to Peakon and iterated on this model further to weigh leads individually rather than by a probability attached to each pipeline stage. Each lead was assigned a unique close probability based on historical conversion rates of similar leads. 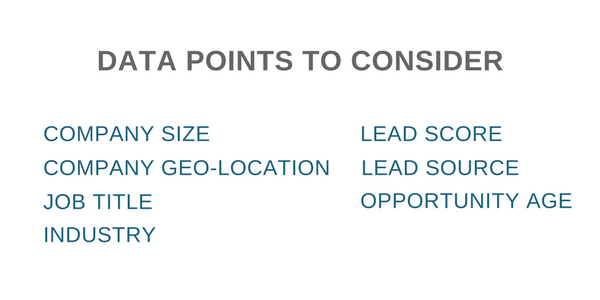 Data points like the opportunity’s age, vertical and company size meant they were able to better determine if an incoming lead could have a good business match and subsequently a higher chance of closing. All sales forecasting methods involve educated guesswork, and it’s important to remember that. There are too many variables to consider and outside factors which can influence your business in ways that are impossible to predict. The goal is not to have a perfect model, but rather have a way to make predictable, informed decisions in a repeatable manner. For more about these prediction models, each of their pros and cons, and how to implement them in your business grab a copy of our free e-book Data-Driven Sales and jump into chapter five today.